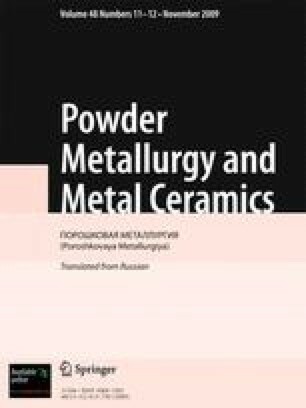 The starting mixtures of ZnO, TiO2, and MgO (0, 1.25, and 2.5 wt.%) powders are mechanically activated in a high-energy planetary mill for 15 min and then sintered between 800 and 1100°C for 2 h. The influence of MgO addition on the structure of the samples obtained is analyzed with X-ray diffraction and infrared reflection spectroscopy. Room-temperature far-infrared reflectivity spectra of the samples doped with MgO (0, 1.25, and 2.5 wt.%) and sintered at 1100°C in the frequency range between 100 and 1200 cm–1 are measured and analyzed. Optical parameters are determined for seven oscillators belonging to the spinel structure using the four-parameter model of coupled oscillators. Born effective charges are calculated from the transversal/longitudinal splitting. Published in Poroshkovaya Metallurgiya, Vol. 48, Vol. 48, No. 11–12 (470), pp. 125–131, 2009.